No matter what time of year it is and how light it is outside, if you are working on your car inside a garage or workshop, lighting always seems to be a problem. The overhead fluorescent lights are good at providing ambient light in large spaces, but usually fail to provide adequate directional light sufficient for working under your hood. A decent flashlight can provide the necessary output, but at the cost of having to manage the light with one hand while turning a wrench using the other. 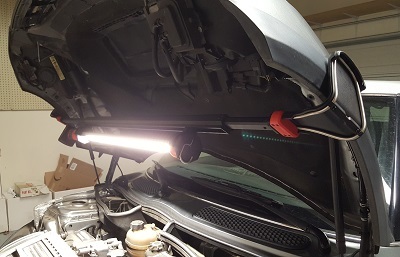 As lighting has always been a pain point for us in our garage, we were quick to jump at the chance when Milwaukee offered to let us demo their M12 LED Underhood Light (part number 2125-21XC) during our most recent oil change. Overall we were quite pleased with the result. After setting the oil drain pan in place and removing the drain plug with a ratcheting wrench, it was time to go to work on the filter. The filter we were removing was accessible from the top side of the engine bay, however as in most subcompact cars it is pretty well buried down near the header up against the firewall. As you can imagine, the filter is in a pretty dark nook within the engine bay, so this offered the perfect opportunity to break out the M12 LED Underhood Light to take it for a spin. For starters, the M12 LED Light is battery powered. While some mechanics may prefer not to manage battery life on a work light, we found the convenience of not having to dodge a cord all the time worth the trade. The light kit comes with a battery charger and one battery. We didn’t run up against the battery life as we didn’t run the light for long enough. However, depending on your brightness setting you should see between four and eight hours before you need a recharge, which is long enough for even more involved car projects. If you are a pro mechanic, you may consider picking up a spare battery just in case you work a long day every once in a while. As far as mounting options, the aluminum frame houses two spring loaded hooks (the hooks spring towards each other) which provide a minimum and maximum length of 48″-78″ respectively. Our fender covers are integrated into our hood, so with the hood up we opted to hook from fender cover to fender cover. The hooks have a soft-touch plastic on the contact surface, so as long as you are careful you can latch onto a painted surface, although we still prefer to latch onto non visible edges or non-painted surfaces if the option is available as an added precaution. Once set in place, the light remained stable without any rocking or movement even as we were wrenching. While we didn’t use the feature for our project, we should note that the light is detachable from the frame and hooks and has another steel hook that allows you to hang the light quite easily which gives you flexibility for vertical mounting. As far as visibility, we opted for the highest setting which provided a comfortable 1350 lumens. This was more than sufficient to get a clear visual on our filter. Based on the geometry of the light, we were still able to see the filter housing as we were unscrewing it, even though our breaker bar as well as our hands were in the thick of things at various points in time. The light also made it easy to position our bag underneath the filter housing to catch any stray oil drops as we pulled the filter out. After a quick swap with a new filter and filter housing gasket, we popped the filter back in as effortlessly as we removed it. Once complete, we reinstalled our drain plug back in and snugged it up into the oil pan, being careful not to cross-thread or overtighten. Immediately following, we added a few quarts of our favorite synthetic oil, screwed the oil cap back on, and we were ready to go! 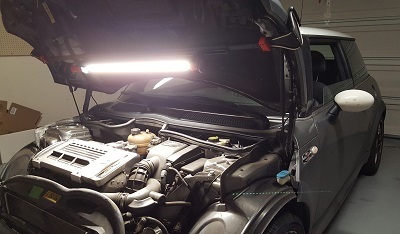 Overall, Milwaukee’s M12 LED Underhood Light performed really well and has far surpassed the automotive work lights we have used in the past. On top of that, the 5 year tool warranty and 3 year battery warranty give us high confidence that the light will be reliable over the long term. As such, we are quick to recommend the M12 Underhood Light as we think it’s terrific. As far as places to buy, we suggest checking out Milwaukee’s website to find a retailer in order to make sure your warranty remains valid. Happy wrenching!